We’re always thinking about next season. Driving overnight visitation to Cabarrus County is our priority, and we also take great pride in our role as a destination management organization. After studying the needs of our community, a vision plan was created in 2011 outlining key components for progress identified in our research. 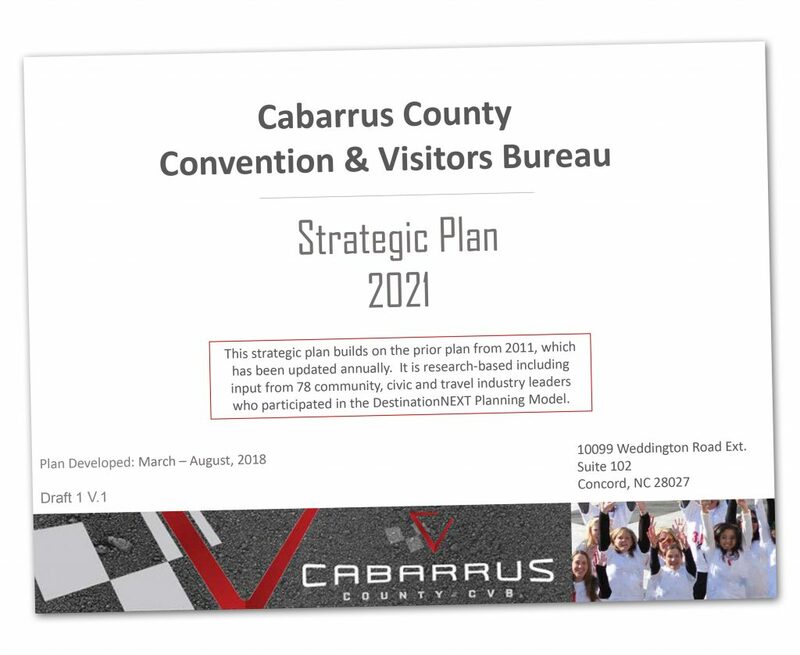 Serving as a road map to developing Cabarrus County as a premier travel destination, the vision plan is the foundation on which the current strategic plan was built. Updated annually, the strategic plan is research-based and includes input from community, civic and travel industry leaders who participated in the DestinationNEXT Planning Model. The goal? To support progress in the areas of three key initiatives—enhanced and improved facilities, better mobility and workforce development. Learn more by browsing the plan now. If you are a member of the media covering the developments and growth in Cabarrus County and Exit 49, please contact Communications Manager, Julie Hinson for additional resources.